Prices and availability vary – Please call for further details. 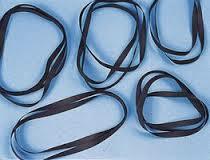 We offer a variety of belts for many different turntables. Not sure what size you need – give us a call with your make and model of your turntable. We have a large database of makes and models of turntables and we can probably find the size for you and have you back up and running in no time. Not local to our area, we also can ship this to you in a standard sized envelope for a nominal charge.